Chennai Super Kings and Sunrisers Hyderabad have made it to the finals of IPL 2018. The two teams which were believed to be the strongest in this tournament have proved it with a series of victories. IPL 2018 had been thrilling in its every step and has offered the cricket lovers a month full of entertainment with matches every day. Here’s a recap of everything that happened. Among a total of 8 teams made up of versatile players from the top cricket teams among the world, only four made it to the playoffs and of them, two made it to the finals. Chennai Super Kings, Mumbai Indians, Royal Challengers Bangalore, Sunrisers Hyderabad, Kolkata Knight Riders, Rajasthan Royals, Kings XI Punjab, and Delhi Daredevils fought it out in the leagues in a double round robin format. Among these, four teams, Sunrisers Hyderabad, Chennai Super Kings, Kolkata Knight Riders, and Rajasthan Royals qualified for the playoffs, by earning a higher number of points than other teams. The first highest point earners CSK and SRH fought it out in Qualifier-1 match and CSK won that battle qualifying to the final directly. Kolkata Knight Riders and the Rajasthan Royals played against each other in an Eliminator match and KKR won in that match to play in the Qualifier-2 match against SRH. And finally, in the Qualifier-2, SRH won the match against KKR to enter the finals against CSK which happens tomorrow on 27th May 2018. The final match of IPL 2018, CSK vs SRH will take place tomorrow in the Wankhede Stadium of Mumbai at 07:00 PM IST. Catch this super exciting SRH vs CSK Live match along with the world on YuppTV from Malaysia, Singapore, Australia, Continental Europe (Except UK), South America, and South East Asia. 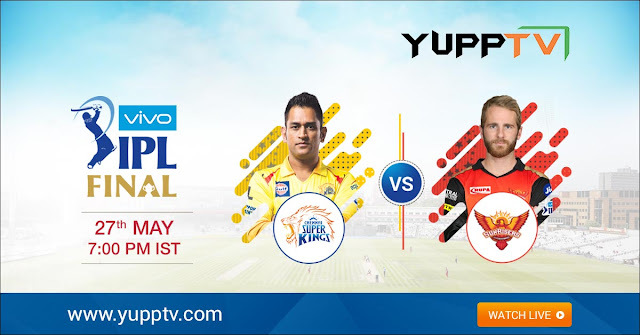 You can download the YuppTV App and watch the Grand Finale of IPL 2018 Live from any internet enabled device.